An out-of-the-box cloud ERP that’s also flexible? New report explains how Acumatica Cloud xRP delivers the best of both worlds for business users and ISVs. Looking for an out-of-the-box ERP platform that also lets you customize and scale as you grow? Or are you an OEM or ISV that wants to build value-added modules for your clients? 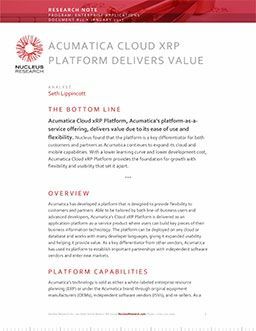 In either case, you should consider what Acumatica Cloud xRP has to offer. That’s the conclusion of Nucleus Research in a new report. The six key capabilities of Acumatica Cloud xRP Platform. Why this platform often tilts the scales in favor of Acumatica. What makes Acumatica Cloud xRP Platform so flexible to specific business needs. Why it’s easy to find developers who can work on this platform. What Acumatica’s continued innovation will mean for your business. Business users appreciate that this platform lets them tweak functionality without involving IT. Acumatica partners love being able to serve multiple customers from a single instance of the platform. Read this report to find out what it can do for your business. This report is offered by Acumatica, a leading provider of cloud business management software that gives mid-sized customers a complete, real-time view of their businesses—anytime, anywhere. Get free Nucleus Research report! Although Acumatica is not positioning itself as a standalone CRM vendor, a single data model, field service and commerce capabilities, and investment in core features such as Outlook and Docusign integration and embedded analytics drive greater productivity and visibility for sales and service users and managers alike.